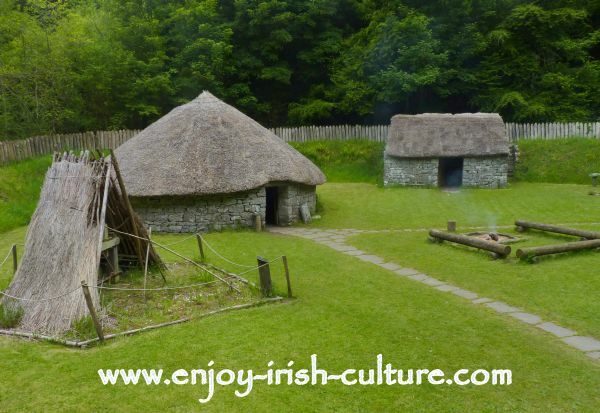 The Ireland heritage museum at Craggaunowen is surely one of Ireland’s best tourist attractions. Visit Craggaunowen with us in this video! Located near the small village of Quin in County Clare, Ireland, the museum lends itself to a half day or full day excursion for the whole family. There is a lovely walk at the lakeside in the woods with many different stops along the way, each one illustrating a piece of Irish history. The museum is open between Easter and August 31st only, so make sure not to miss this slot for your visit! Highly recommended. We think Craggaunowen brings out the child in everyone, big and small. It makes you want to go off exploring all the hidden treasures in this magical spot. Read tourist information about Craggaunowen here including directions and ticket prices and our special tips. Crannogs are ancient dwelling sites on artificial, man-made lake islands, and exciting and unique part of Ireland heritage. Ireland has the most crannogs in Europe which started to appear from the bronze age on. Again, crannogs were circular in shape mostly, and they were defended with wooden stakes all around the perimeter. Crannogs were mostly residences, but some were used for other purposes such as metal work. 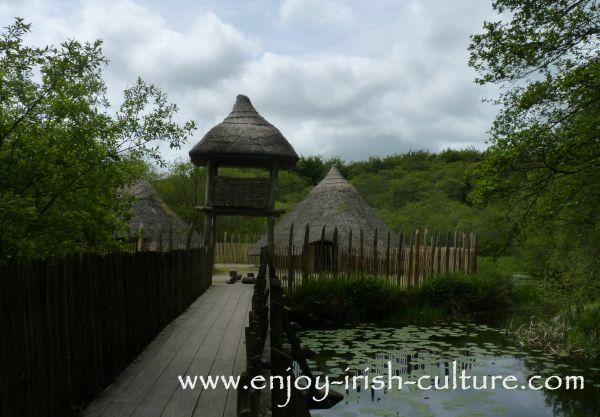 See the crannog at Craggaunowen on the photo above. Ring Forts were an ancient type of residence in Ireland. Ring forts and stone forts were built from the bronze age on. Ring forts were defended residences with a circular mound around them that was topped with a wooden palisade which you can see on the photo below. Inside the ring fort were stone huts or wattle and daub huts typically with a thatch roof made from whatever local materials were available to the builders. Find tourist information on Craggaunowen including directions, prices and special tips here. Find out about the dwellings of the ancient Celts. 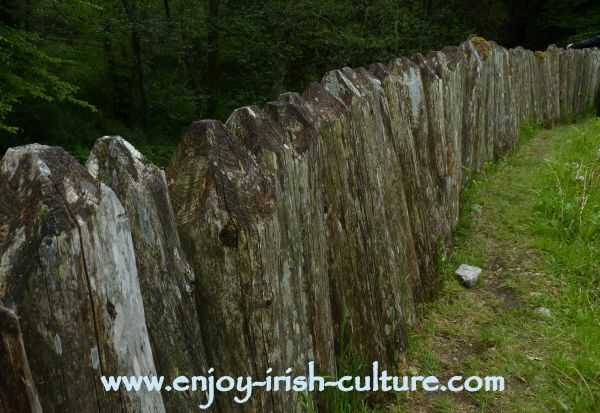 Find out about the cattle herding culture of the ancient Celts. 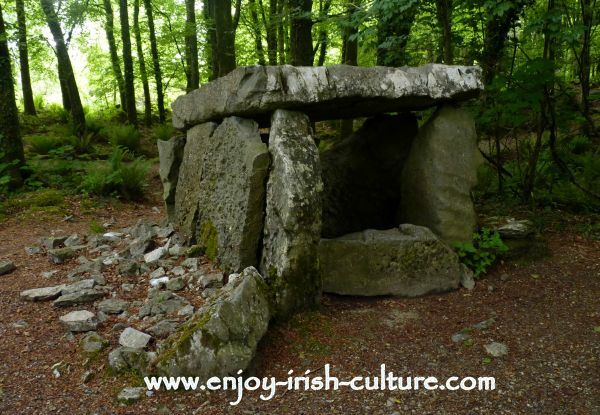 Read about neolithic Ireland, find out about the neolithic sites at Newgrange, Carrowkeel and Carrowmore. The ring fort at Craggaunowen has a souterrain. The souterrain was a multi-purpose institution. It was a place to store foods that needed to be kept cool, as well as a secret passage way out of the ring fort as a last solution should the place come under attack. Castles are part of Ireland's heritage of medieval times. 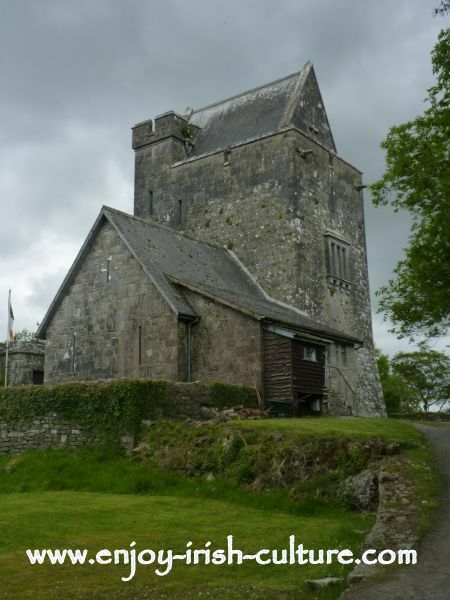 They started to be built in Ireland about a generation after the arrival of the Norman invaders in 1169. 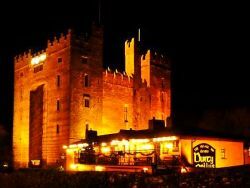 The 15th century saw a massive building boom in castles when every local landowner, both Irish and Norman, wanted their own castle, or better even a number of castles in different locations around their vast estates. Craggaunowen Castle is a so called Norman Tower House, the most common form of castle seen in Ireland. These castles were built as a fortress primarily but some people also started to display their wealth during late medieval times. 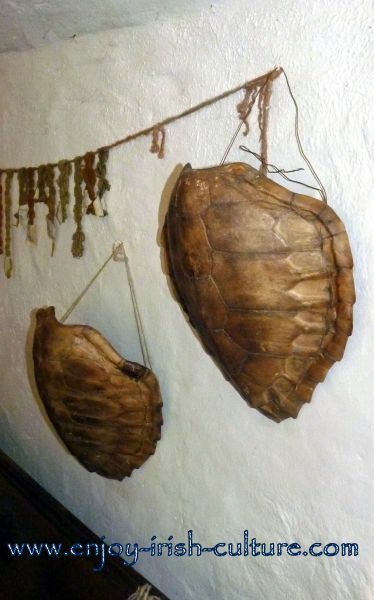 One such example that can be seen at Craggaunowen are the tortoise shells at the castle, these were status symbols of the upper crust demonstrating how far they had travelled. Tortoise shells were produced at feasts to serve up food in them. The fulacht fia is part of Ireland heritage as a common archaeological site in Ireland found near ancient dwelling sites. It is commonly thought to be a cooking site where water was heated with large hot rocks that were heated in a fire. But there are other theories, too. For example, through practical testing, it has been shown that a Fulacht Fia could have been used to brew beer. 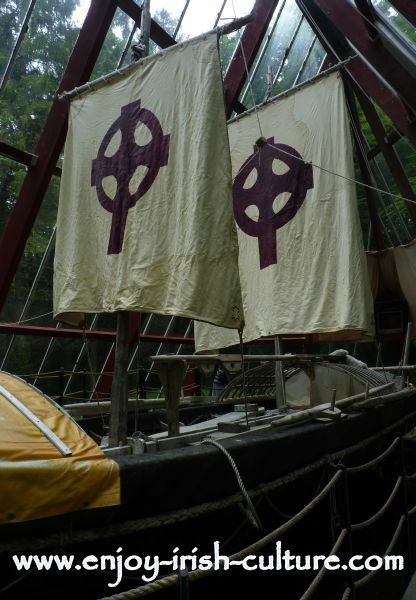 The leather hulled curragh boat of the explorer Tim Severin who showed that Saint Brendan could in fact have made it all the way across the Atlantic in his day, which would credit him with the discovery of America over Columbus. To anyone who has read the Brendan Voyage, seeing this boat in real life is a big treat. And anyone who hasn’t read the book, will want to do so after the visit! Hi there, did you like what you saw and read about Craggaunowen? If you did and if you like what we do, why not support us with a social shout out? Your support would help others to find our website and to enjoy our content, too! For your convenience, we provide a selection of social options at the top left and bottom of all pages, just pick the one you like and it will only take a few seconds. Thanking You!